To demonstrate how great 'The Dregs' #3 is, this is where I'd normally scrutinize the series as a whole based on the direction of the third issue but it not only exceeded my expectations, it did so without giving me what I was looking for. Arnold continues to investigate the disappearance of his friend Manny. A journey that takes him out of the Dregs momentarily and out of his comfort zone. It's a difficult chore as he deals with severe withdrawals from Listo but with a determined spirit, the will of Phillip Marlowe, and one imaginary muse he keeps digging for clues and leads. Throughout the series, the underlying story is the plight of Vancouver's homeless population and the gentrification that keeps pushing them out further and further away from the streets they called home. Writers Zac Thompson and Lonnie Nadler integrate these real world conditions into the story seamlessly so it never feels heavy-handed. They also never let you forget who Arnold is and how he fits or doesn't fit in the world. It's part of what makes 'The Dregs' so powerful. In a way, Arnold's story is the untold story of marginalized people we ignore every day. It's brilliantly illustrated by Arnold simply asking for directions only to be dismissed as a beggar. Or being asked to leave a coffee shop because the patrons become bothered. Probably more dispiriting is seeing Arnold return to a very different Dregs as the wheels of progress keep turning ever faster. It's poignant but Arnold remains resolute in his search for answers never succumbing to victimhood. He's smart with great instincts and that's why the approach the writers take in using a pulpy detective story is so effective. Arnold's love of detective Marlowe gives him inspiration and direction. His inner monologue has the exposition of a crime novel but it really reveals his connection with the city and his place in it. He may be having delusions but he's not delusional. He understands his place in the food chain but he's unfazed by it. He's got a job to do, after all, find his friend. With all this great writing it takes a special team of artists to bring it to life and Eric Zawadzki and Dee Cunniffe are that team. Zawadzki unfolds the story with an unflinching look at Arnold. A page full of panels, each with a portion of Arnold's face, his shaky hands, greasy hair, and overgrown beard force the reader to look at him. The camera stays fixed on his face as he walks the city streets juxtaposed against a vibrant populace causing him to stand out like a sore thumb. More importantly, we're forced to see Arnold. As we do, he becomes more than just a homeless addict, the layers begin to strip away and all we see is a human being. Someone looking for the way things used to be only to find themselves crushed under the weight of merciless expansion. Cunniffe gives 'The Dregs' its lifeblood with a surprisingly colorful palette. The transition in and out of the Dregs is considerably stark. It's like walking out of Oz and into 'Blade Runner,' light to dark, vibrancy to apathy, while Arnold remains exactly the same. Soon, the Dregs will fully be in the light and where will Arnold fit then? 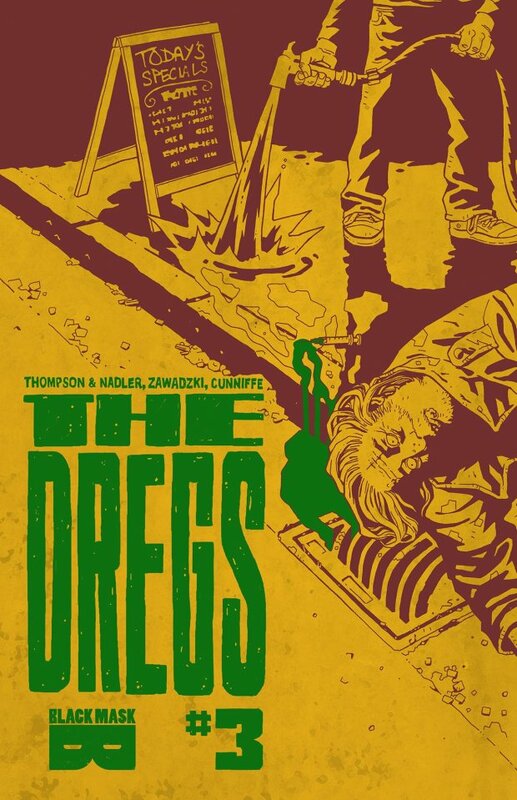 'The Dregs' is certainly one of those hidden gems that you find from word-of-mouth and cherish as your secret treasure. It deserves so much more than to be a selfish delight and should be shouted from the rooftops. Here's an expertly told story from a passionate team of writers and artists that have more on their minds with a socially aware comic that works as hard-boiled pulp. I was ready to judge it on whether they'd go back to what happened in the opening issue and explain what they foreshadowed. They didn't and it didn't matter. Arnold is the star and wherever he goes is where the story follows. Period. The first two issues garnered 5 out of 5 stars each. Issue 3 is even better.